BC's Best Kept Secret for West Coast Salmon and Halibut Fishing! How would you like to come fish with us? 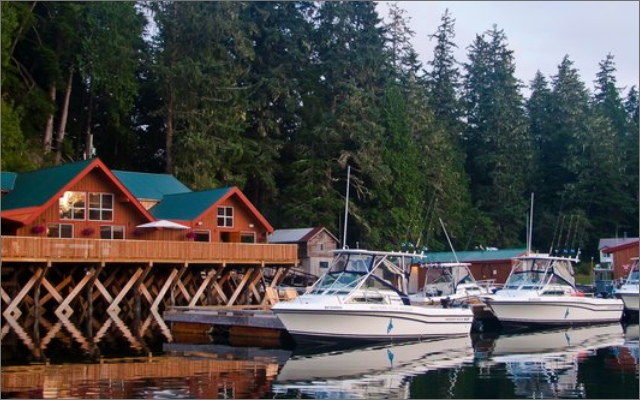 Live out your dream of sportfishing in BC with Walters Cover Resort. We make BC saltwater fishing exhilarating, affordable, and challenging no matter what your skill level. Fly in, drive in, or bring your own boat! Whether you’re arriving from out-of-province or across the border, we welcome all guests to experience this special West Coast adventure. We have everything you need to have a fishing trip of a lifetime. Reconnect with nature and improve your fishing game with our special West Coast salmon and halibut fishing packages. Challenge yourself and experience a thrill of a lifetime with salmon fishing in Kyuquot on Vancouver Island. There’s nothing quite like bringing home your catch of wild Pacific salmon in British Columbia’s most breathtaking setting. Book now! No fishing trip in BC is complete without reeling in some delicious halibut. This popular catch is a challenging and fun sport for fishing enthusiasts who want to spend their holiday at a Vancouver Island fishing lodge in Kyuquot. Book today! Enjoy a trip to our Vancouver Island lodge from wherever you are with our fly-in fishing trips! Walters Cover Resort offers round-trip transportation from Richmond or Vancouver, BC to our lodge. Book your fly-in fishing trip today! If you enjoy the journey just as much as the destination, consider driving into Walters Cove Resort for your next fishing trip. End your epic road trip with a three- or four-day fishing experience. Book today! There’s nothing quite like fishing in British Columbia from the comfort of your own boat. We have plenty of room for our guests to moor their fishing boats at our lodge. Book your trip now!